Everyone loves a man who's not afraid to get dirty and who knows how to clean up. Any rough-and-tumble guy can keep himself fresh, smooth, and smelling great at the end of the day with this full set of handmade skin supplies. This handsome gallon-sized container (complete with its own can opener which doubles as a bottle opener!) comes stuffed with everyday essentials like fresh-scented soap, shave gel, bay rum oil, hand butter, and an exfoliator. Made and assembled in the USA. Bay Rum Oil: 4 oz. Please note: The Man Can Grooming Kit has been discontinued. Once it sells out it will no longer be available. Got this for my brother's bday and he loved it, saying "it all smells GREAT!' Cool gift! Good for daily use. Got it for my brother and he was soo excited. The can is an actual painting can that can be used again and again, which I did not expect. The soaps and foam smelled rich and robust. The bar of soap even smelled of black licorice. I was a little put down when the bottles were mini sized... I really expected a little more for the value of the package. What a pleasant surprise. The items were presented very nicely. The labeling was very manly and so were the smells. A great but for the man who likes to take care if himself. loved the theme and the contents!! it was a great gift idea and perfect for the man that has everything! 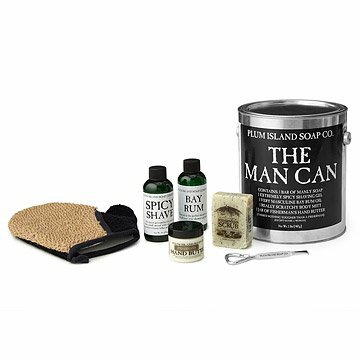 The perfect gift set for men, featuring handmade skincare products stored in a gallon paint can.